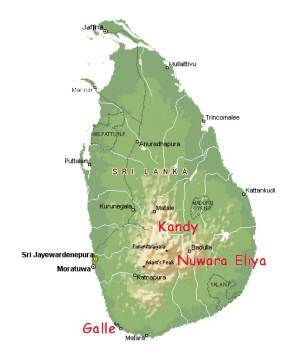 Next on our cruise, this country, formerly known as Ceylon has had ongoing strife for 15 years, but the government and the Tamil Tigers are now talking, and peace may be breaking out. Galle - This is the port city that most cruisers choose since it represents a small diversion from the direct route to the Red Sea. It is a Navy facility, and we had to squeeze by a defensive anti-submarine net, and tolerate dynamite charges set off randomly throughout the night to keep the Tamil Tigers from sabotaging Navy ships - fun it was NOT! The inner harbor has 2 pontoons and mooring buoys, and yachts wove spider-webs trying to secure ourselves from the surge from ships using the port. For 4 days, a bulk-carrier up-wind of us unloaded cement by the shovelful, and we collected buckets of it on our decks. 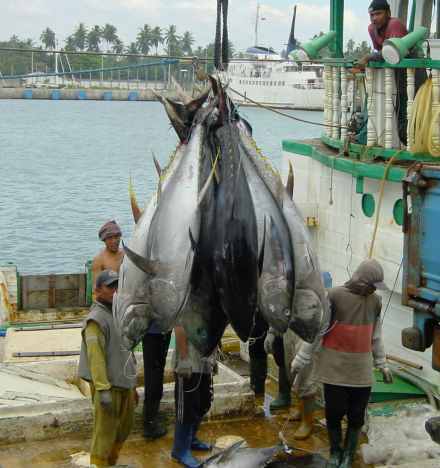 The port is very busy with tune fleets from around the Indian Ocean bringing their catch in daily. Nuwara Eliya - This is a quaint town with scenic mountains, souvenir shops, golf courses and resort hotels. We stayed at The Hill Club, an old English colonial resort with sitting rooms, game trophies, and reading nooks. It was a delightful break with hot water bottles in our bed at night (we needed them), and obligatory coat and tie for dinner for the gentlemen. Clothing outlet shops offer seconds from LL Bean, ... and other notable names. Kandy - The largest town in the hill country, Kandy has lots of shops and a few tourist attractions. For Sri Lankans, the primary attraction is the Temple of the Tooth - a Buddhist temple that is reputed to store, and occasionally display, one of Buddha's teeth . We patiently waited in the various queues and toured the temple, but only special dignitaries get to glimpse the actual tooth. Kandalama Resort - In the middle of the bush this a 5-star resort offered the best food we have had for months, and beautiful surroundings. We dragged ourselves in dripping wet and smelly from a long hike in a rain-storm but the staff was not fazed - they greeted us with fresh juice and tolerance. The Tea Plantations - Sri Lanka (aka Ceylon) is famous for its tea, and the hills are covered with neatly organized plantations. All offer tours, and we visited one where they patiently explained the process that takes freshly picked leaves, and turns them into tasty Orange Pekoe tea in 18 hours. 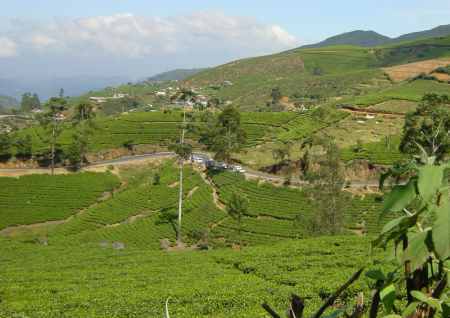 Our Views - We are glad we visited Sri Lanka, and the Hill country was beautiful and the tea plantations a delight. That said, the country is very dirty and gave us a preview of what India is reputed to be. The officials were corrupt, overcharging for the privilege of 'serving' us. After an interesting stay, we set sail again - this time for the Maldives, an archipelago between us and Africa.